Along with experiencing their fair share of ordinary troubles, Da Ra Bendre and his wife had to deal with the terrible grief of losing six of their nine children (including one when he was twenty and in his prime). Completely lost in his books, his poetry and his circle of friends (ಗೆಳೆಯರ ಗುಂಪು), Bendre left the responsibility of looking after the house entirely to his wife, a responsibility she bore with stoic fortitude. Never well-off, constitutionally frail, and constantly wounded by the deaths of her children, Shrimati Lakshmibai Bendre’s was an obviously difficult life. It is no wonder then if her smiles were often masks worn upon an inner grief. Not oblivious to her suffering, this is one the many (sympathetic) poems the poet has addressed to her – his wife and his sakhee. Tell me, who taught you such trickery? That I am one who’s heartless? An ùntrue happìness be made to play? Make true sorrow go away? O friend and partner of my life! When you are sùch an àctress? An obviously satirical poem. “Milord” is the translation of the original poem’s “ಭಟ್ಟ,” a most felicitous translation if I say so myself. As usual, here is a my recording of the original Kannada poem. The voice of milord was shouting away. Then rushed away along the drain. The little black pup paddled furiously. A ‘thud!’ was the immediate answer. O golly, O gosh, how brave of milord! No house could have asked for a better guard. ‘You try, and I’ll kill you,’ replied his lordship. P.S: I have revised the second stanza of the poem to better reflect the original’s lines. My thanks to Sunaath Kaka for alerting me to the possibility of a better version and for offering his own couplet (which I have drawn from but not used). Yugādi (ಯುಗಾದಿ) is a festival that celebrates the beginning of a new year (ಸಂವತ್ಸರ) according to the Hindu lunar calendar (ಪಂಚಾಂಗ). 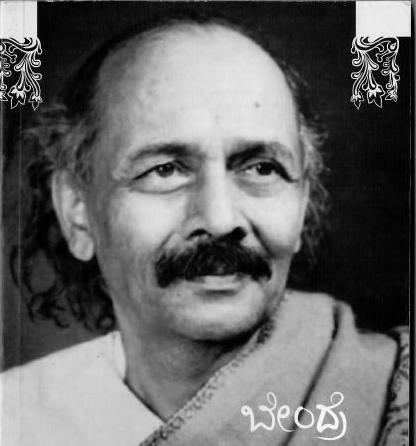 This tremendously popular poem by Da Ra Bendre – from his very first poetry collection, ಗರಿ – has become an inseparable part of the festival in Karnataka. New Year’s dáy is here again. And things that are newer and newer. Their symphoníes are heard again. And lo, the glow of life is seen. It now waits eagerly for him. Within the hearts of all that move! Is that all that we desérve? Why haven’t we been blessèd so? Does such a gift not interest you? But not a single one’s for man! May only what is good through this world spread. May live among us good enfleshèd.